Explore the beauty and benefits of wide plank flooring. Live Your Life on a Work of Art. The artisan craftsmen at Carlisle have been handcrafting wide plank hardwood, pine and reclaimed wood floors for half a century. Our American-made wood floors are found in museums, upscale restaurants, trendy retail stores and beautiful homes throughout the world. Whether you select a Carlisle Collection Floor or a Carlisle Custom Floor, your flooring is made to order according to the exacting requirements that only our Slowcraft® process can provide. Nothing compares to the beauty, grain density, superior strength, stability and performance of a Carlisle floor. The rich color, distinctive character and unparalleled beauty will create a timeless work of art for any project. 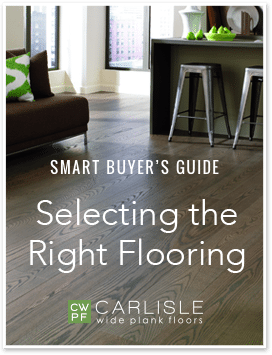 Your free 19-page guide features a closeup look at how our craftsmen combine traditional and modern methods to create custom floors that enhance the beauty, comfort and value of your home.